FOXBOROUGH, Mass. 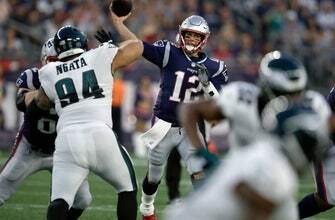 (AP) — Tom Brady moved the New England Patriots with ease in their Super Bowl rematch against the penalty-prone Eagles, winning 37-20 with a little help from running back James White and fifth-round draft choice Ja’Whaun Bentley. 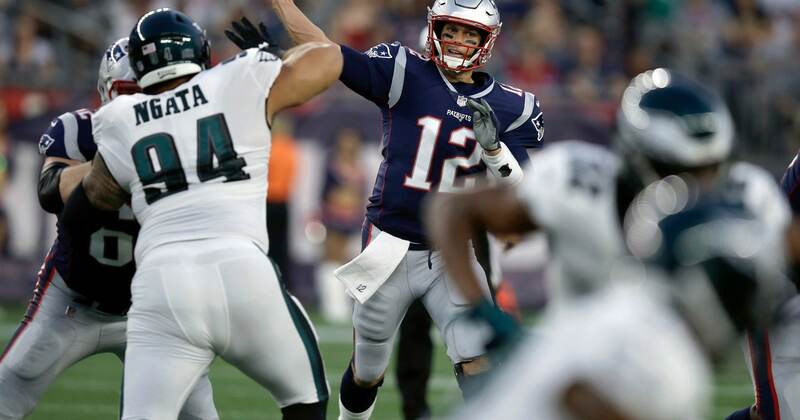 In his first action since losing in the NFL title game to Philadelphia, Brady completed 19 of 26 passes for 172 yards and two touchdowns on Thursday night to help stake New England (2-0) to a 27-7 halftime lead. White caught six passes for 61 yards, including a 20-yard touchdown, and also ran for 31 yards in the first half of the Patriots’ 37-20 victory. The Eagles (0-2) had five penalties for 50 yards in the first quarter — including two for lowering the head to initiate contact and one for hitting a defenseless receiver — and 97 penalty yards in all. After sitting out last week’s exhibition season opener, Brady led New England to scores on four of the six series he played. LANDOVER, Md. (AP) — Sam Darnold threw an interception and showed some of the growing pains of a rookie quarterback in his first preseason start for New York, which lost to Washington on a last-second field goal by Dustin Hopkins. Darnold threw an interception, took two sacks and had a couple of balls batted out of the air. It was a far cry from the impressive debut in which the third overall pick went 13 of 18 for 96 yards for the Jets (1-1) and looked like the front-runner to win New York’s starting QB competition. The former USC star played the entire first half before giving way to veteran Teddy Bridgewater. The former Vikings quarterback had his own inconsistences, going 10 of 15 for 127 yards, a touchdown and an interception. Alex Smith was 4 of 6 for 48 yards in one series, his only work so far in the preseason for the Redskins (1-1). Hopkins made all five of his field-goal attempts, including a 40-yarder as time expired to win it. GREEN BAY, Wis. (AP) — Aaron Rodgers needed just one drive to look at home in his first action at Lambeau Field in almost a year. Rodgers connected with tight end Jimmy Graham for an 8-yard score, and Tramon Williams had a 25-yard interception return for a touchdown on the first play from scrimmage of Green Bay’s win. Five minutes after throwing the pick, Mason Rudolph found JuJu Smith-Schuster for a 4-yard touchdown pass for Pittsburgh (1-1). Rudolph, who is competing with Joshua Dobbs for a backup job, was just 5 of 12 for 47 yards in playing the first half. Dobbs didn’t look much better after throwing a 22-yard interception returned for a touchdown by rookie cornerback Josh Jackson in the third quarter for the Packers (2-0). But Dobbs finished strong and connected with rookie receiver James Washington for two second-half touchdowns. Media Circus: How Critical Will ESPN Be of Jon Gruden’s Coaching Tenure With the Raiders?